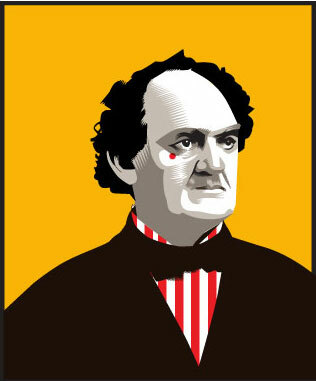 Working on a sketch for Barnum. Quick and dirty vector/ not for the final...just more blocking. I hope to output this and work on top of output...putting in a poster, maybe some drapery. I will do a second version with some of his people/ creatures in the background...FeeGee Mermaid? Jumbo? The freaks are confusing...the quesiton is how to make them work as they are so odd that they might compete with the strength of the man. Closing of school/starting of summer stress is happening. It is scheduled out through til end of August with too much overlap and frankly, not much of a break. The weeks I am going, we are going to have 4 guests on top of it all with random visits and different comings and goings with pick ups at airports etc. I am doing a courtesy week of someone sitting in with us...with a small project for her do do. I have moms around here calling me asking very vehemently to hire their kids as they cant get "real" jobs with their summer schedules...so I have become the fallback employer. Also, I we are having a closing on a real estate refinance before I go to Hartford. And appointments, checkups, doctors are wedged in between... Sorry to vent...It's just nutty. The college thing is making me quietly crazy. Our scores and grades are just this side of totally being in the middle. Plus, my teen has no interest in getting materials, doing research etc. and when approaching the campus reacts to whether the kids are cool or not...forget everything else. I tell you, for the fortune and stress of paying for that fortune, community college looks like a viable option to get the student to engage in this stuff. and get that resolved. R. is off to Seattle on Sunday. I feel like we are grinding out one week to the weekend. Maybe we can see the Sufferjets tomorrow night just for us.